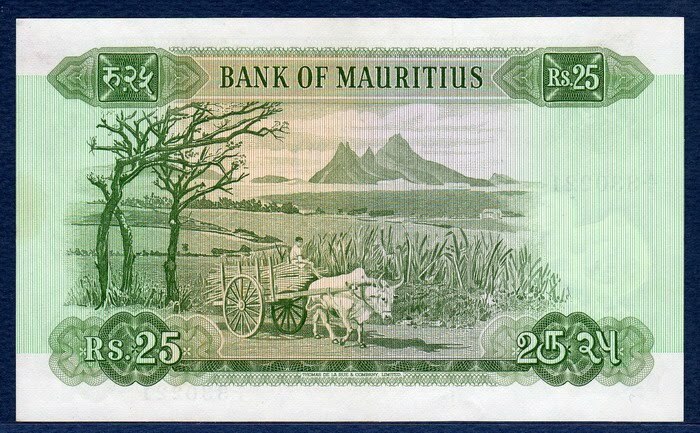 Mauritius banknotes, Mauritius paper money, Mauritian rupee banknotes, Mauritius paper money currency collection, British Commonwealth Banknotes. Obverse: Portrait of young Queen Elizabeth II in the robes of the Sovereign of the Order of the Garter. This portrait of the Queen is adapted from a painting by Pietro Annigoni. The portrait was privately commissioned by the Worshipful Company of Fishmongers in 1954, but not completed until 1955. The painting is now displayed in Fishmongers' Hall, London. The full length portrait features Her Majesty wearing the regalia of the Order of the Garter, standing regally with a distant but lonely aspect. The portrait is regarded by many as one of the finest portrayals of the young Queen. This is the De La Rue version of the portrait. In this version, the darker shading on the side of The Queen's face below her temple has a distinct edge, highlighting her cheekbone. In addition, the braid on her cloak is drawn more simply and regularly. The value of 25 Rupees written in English, Tamil and Hindi. Printed: Thomas De La Rue, London England. The Mauritian Rupee is the currency of Mauritius. The first banknotes were issued by the government dated 1876 in denominations of 5, 10 and 50 rupees. 1 rupee notes were added in 1919. In 1940, emergency issues were made of 25 and 50 cents and 1 rupee. In 1954, 25 and 1000 rupees were introduced. 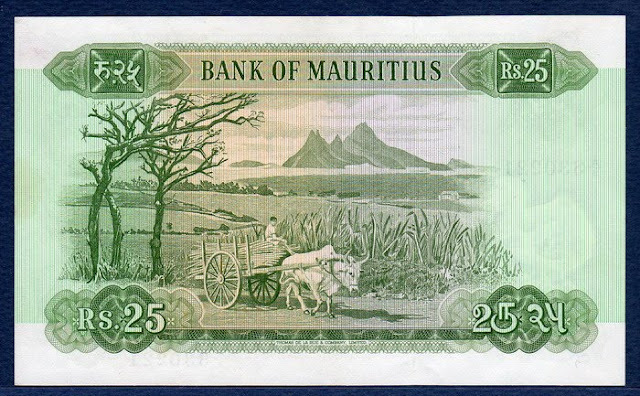 The Bank of Mauritius was established in September 1967 as the nation’s central bank, and has been responsible for the issue of banknotes and coins since that time. 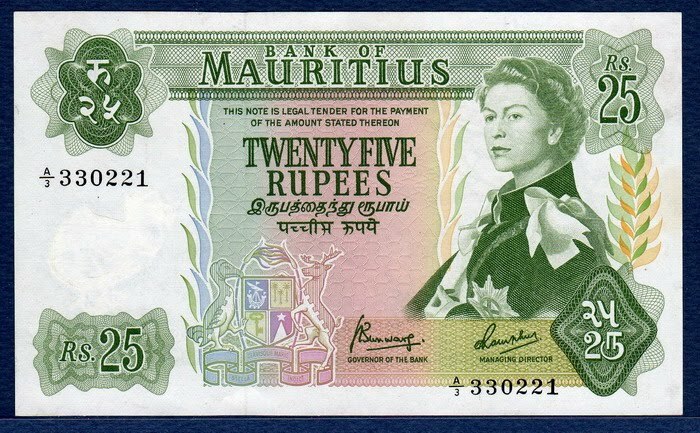 The bank issued its first notes in 1967, comprising four denominations: 5, 10, 25, and 50 rupees, all undated and featuring a portrait of Queen Elizabeth II on front.